Lesotho wordt geheel omsloten door Zuid-Afrika. Bij de onafhankelijkheid op 4 oktober 1966 kreeg het toenmalige Basutoland de naam Koninkrijk Lesotho. Een gekozen regering werd in ere hersteld in 1993. 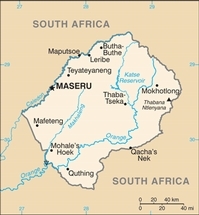 De hoofdstad van Lesotho is Maseru. Het land is lid van het Gemenebest. 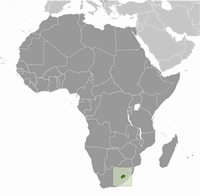 The tiny country of Lesotho is entirely surrounded by South Africa, yet it remains one of the most remote and unexplored areas in the region. The reason for this isolation is the mountains -- row upon row of serrated peaks make this the country with the highest 'low point' in the world. 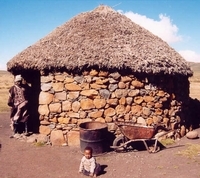 But the mountains that give Lesotho its dramatic landscapes have also played a crucial role in creating a country with a unique history. It's a stirring story of courage and cunning, featuring remarkable individuals such as King Moshoeshoe -- founder of the Basotho nation -- who first gathered people together on the flat-topped hill Thaba Bosiu, the mountain of night. Today, Lesotho is an irresistible lure to adventurous travellers who want to head off the beaten path and tackle the mighty mountains. But Lesotho isn't as inaccessible as it seems. The country is bisected by a number of tarred and gravel roads and these lead the motorist on jaw-dropping drives through some of the highest mountains this side of Kilimanjaro. Small rural villages nestle on the slopes, much as they have done for over 200 years, and delightful lodges are tucked away in secluded valleys. All in all, it's a land of secret vistas and pristine scenery. This book is the first travel guide dedicated solely to Lesotho. It will give the traveller an insight into the remarkable history of the country. Suggested itineraries are included, along with accommodation options, leisure activities and other useful information for trip-planning. NL71 INGB 0005 3180 28 ten name van Interglobe Utrecht. Vermeld bij 'Mededelingen' het 6-cijferige referentienummer.